SMALL JUNIOR DRUM SET – Buy your child their very own Kid’s Drumset and they can rock out to the music like the pro’s. Designed after the “grown-up” drums, this small, child’s drumset features a 12″ bass drum, 10″ snare drum, 8″ tom, 8″ brass cymbal, metal rims and attachments, junior bass drum pedal, drumsticks, tuning key and real “tune-able” drumheads! Add to this “real wood drum shells” and this makes the perfect music gift for kids! Some assembly needed for this drumkit. Appropriate for ages 3 to 8. 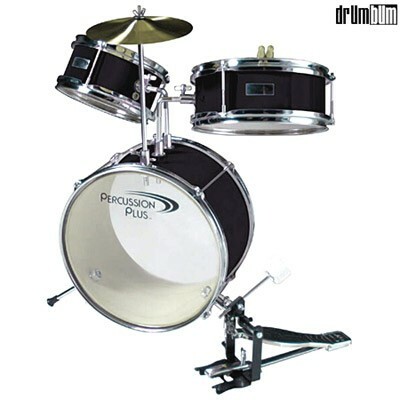 Awesome kid’s drums, junior drumkits and drum set accessories and gifts at DRUM BUM! Small Kid Drumsets and Toy Drumsets at DRUM BUM! Is your little one banging on everything in site? Or maybe he just wants to emulate dad. Make his birthday or Christmas morning by buying him his own junior drumkit to beat on ’til his heart’s content! We’ve got many kid’s drumsets for children to choose from in all colors. If your child is very small, the little 3 piece kit’s will do. Once they get some size on them, they’ll fit into the larger drumsets that are still sized for children but fit them better. Have questions about which is the right drum set to buy them. Feel free to contact us any time for assistance.